nanny boy enjoyin the ride on a cool chill sunday evening. We hitup the local gas station for slurpees with the kids and some mellow riding, good times for sure. Much better picture than the last one of Nain riding. But this one, he's less of the Fonzie. Still, to make up for the lack of trip to the homeland with the old folks this year (India), you could have done the standard thing they do over there, i.e. : load all four of you onto the one bike. I kid you not. 4 people on a scooter is standard. 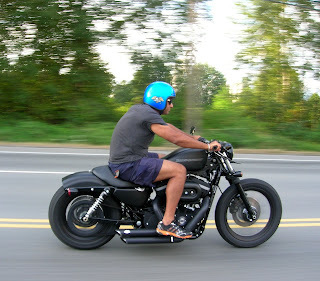 On a Harley, you know it can take a lot more folks... :-) Amrit.